TRI-COUNTY AREA (6/24/16)- Area schools held graduation ceremonies, Friday, June 24 to celebrate the class of 2016. School administrators, distinguished speakers and students spoke about the importance of the lessons and memories from high school, and ways to take the learned knowledge forward to the next step in life. 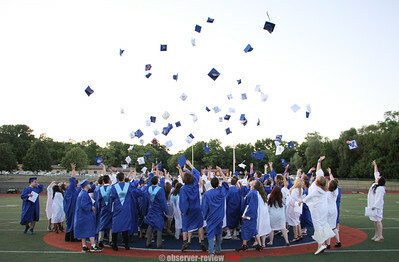 Penn Yan held the 158th commencement program Friday night at the athletic complex. Penn Yan's guest speaker was Mrs. Karen Fingar who talked about how important attitude is when approaching work. "There are several other qualifications besides education that will help you determine success in life. One of these attributes is a good attitude; the attitude that you take in approaching your work is important. [...] It's not the work itself, but the attitude that you bring to the work that makes it a good or bad experience." Class secretary Dennis Youngs celebrated his time at Penn Yan but also reminded everyone of the role a community plays. "Some of the most important lessons in life come from our families and our supportive community. They provide support and guidance as we matured into young men and women. They help to teach us morals and show us some of the most important lessons in life, like helping those in need." Senior class president Craig Gerhardt incorporated the convergence of school and community saying, "Use your strengths to continue building good relationships, work hard and accomplish what you want. There will be many ups and downs, curves and loop-de-loops in our lives, but one thing will always be there and that is the foundation of our lives here in Penn Yan." Faith Colaneri concluded by saying "No matter where your future endeavors take you, whether it be moving on to higher education, entering the service, joining the work force or taking a break to discover who you really are, take the time to reflect from where you've come." Odessa-Montour held the annual graduation celebration in the Fetter-Brown auditorium Friday evening. The valedictorian was Logan Barrett and the salutatorian was Mechel Wead. Barrett addressed the class saying "What brings us together? We are a family here, I've known a good majority of all of these people since we were young. We are always there for each other, and if that doesn't show you what our generation is like then I don't know what will." Wead added "Remember life always offers you a second chance, it's called tomorrow." Hammondsport Central School conducted their commencement exercise in front of the school with family, friends and school officials in attendance. The valedictorian was Helena Carvajal and Gregory DiTomasso was the salutatorian.